A guest session on an Isle of Wight syndicate lake allowed Simon Dew to catch a UK fish bigger than anything he’s caught abroad. The 52lb 6oz mirror came during a 48-hour session that also produced fish of 26lb 8oz and 33lb 10oz. He explained: “This was a great privilege and I'm really grateful to Tim Oatley the owner for allowing me to fish there. After a quiet opening 24 hours, the wind changed direction and the action began at midday with the capture of the 26lb 8oz mirror. 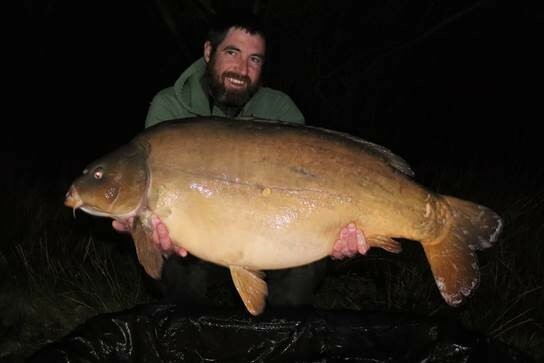 Simon added: “Later that evening I received another take on the same rod and landed a lovely 33lb 10oz mirror. “I was over the moon as this was my biggest fish of the year so far. Little did I know the best was yet to come! “Around 10.30pm the same rod was away yet again and this time the fish felt altogether different. It went on long runs along my right-hand margin between the island and the bank and then plodded out in open water in front of me for 15 minutes or so. Simon used Richworth S-Core pop-ups over match freebies on Withy Pool rigs made with size 6 ESP Curve Shank hooks and 20lb ESP Stripteaze.